When people analyze Navy’s run of success over the last decade, one of the most common reasons given for that success is coaching continuity. There’s a lot of truth to that. Navy’s coaching staff has experienced some of the least amount of turnover in the country. But why is continuity so important? I recently had a conversation with someone about MAC football, and I made the point that it’s difficult for any MAC program to sustain success for very long. As soon as a team gets any good, a school with a bigger budget hires their coach away. Sometimes he’s replaced by someone from the staff that keeps the momentum going, but then he gets hired away and the cycle continues. Hiring coaches is a difficult task, and there’s a measure of luck involved. The more coaches you have to hire, the more likely it is that your luck will run out and you’ll eventually hire the wrong one. That goes for assistant coaches too. Besides, every time you’re forced to hire a new head coach, recruiting takes a hit. It makes it tough to build a winning program. The conversation was about the MAC at the time, but the same could be said for any school with a smaller budget. Western Kentucky fits in that category. This is the final game of a 4-game series between the two schools that began in 2009, and the Hilltoppers have had a different head coach on the sideline for each of them. Willie Taggart and Bobby Petrino both left for higher-profile gigs, leaving Jeff Brohm the task of maintaining their level of success. Not that Brohm wasn’t part of that success. He was WKU’s offensive coordinator last year, leading a productive unit that averaged 458.5 yards per game on the way to an 8-4 record. That seems impressive until you look at what the Hilltoppers are doing now. Texas A&M has 68 plays that have gained 10+ yards this season, tied with Western Kentucky and Washington State for the most in the FBS. Most successful 3rd down conversion teams so far: Auburn (63%), Alabama (62%), Western Kentucky and Texas A&M (60%). The cork has popped on the WKU offense and it’s spraying the ball all over the place. The Hilltoppers trail only Baylor and Texas A&M in total offense, averaging an astounding 608.7 yards per game. In last year’s game, WKU had a very balanced, pro-style offense that featured do-everything tailback Antonio Andrews, who ran for 182 yards on 32 carries. This year is all about throwing the ball, with the country’s #2 passing offense at 486.3 yards per game. Brandon Doughty returns at quarterback this season, and is flourishing in the new scheme. He’s completed nearly 66% of his passes while throwing for 12 TDs and only 2 interceptions. That’s pretty remarkable when you consider that he’s thrown 170 passes in only 3 games. He’s already broken the school record for passing yards in a game twice this season, and the 593 yards he had last week against Middle Tennessee State set the Conference USA record. Amazingly, that’s not even his most impressive stat from that game. More impressive than the cumulative numbers is his efficiency; Doughty didn’t throw consecutive incompletions until his 41st and 42nd passing attempts of the game. That’s incredible. A big part of WKU’s offensive success is that it masks the unit’s weaknesses. The Hilltoppers have one of the more inexperienced offensive lines in college football this year, yet despite throwing 56 passes per game, they’ve only given up 5 sacks. The reason for this is that the ball gets out of the quarterback’s hands in a hurry. Western Kentucky’s passing game is very horizontal, which also contributes to Doughty’s high completion percentage and low number of interceptions. It uses primarily low-risk passes, with other receivers expected to pitch in by blocking downfield. It’s sort of the same approach that Navy’s slotbacks have; they all know they have to be good at blocking, because when they have the ball, another receiver will be blocking for them. More than 37% of Western Kentucky’s passing yards come from yards after the catch. Another noteworthy feature of WKU’s offense is their tempo. Among the top 10 offenses in the country, WKU has the lowest yards per play average. A lot of their yardage comes from simply running a lot of plays. This places a lot of pressure on the Navy defense. Texas State was another up-tempo team, and that game might have been Navy’s worst tackling performance of the season. For a team that relies heavily on gaining yards after the catch, a defense that has trouble tackling is music to their ears. The Mids will have to show that their performance in San Marcos was an aberration. The Hilltoppers don’t run very much; it’s more to keep defenses honest than it is a featured part of the offense. They’ll run the ball to make defenses respect the middle of the field, then throw deep when defenses start creeping up to stop all the bubble screens and short passes. In a lot of ways, they look like the Missouri team that the Mids played in the 2009 Texas Bowl. If there was ever a time to dust off the “Star Wars Defense,” this would be it. Despite all of WKU’s offensive fireworks, they’re still just 1-2. That’s because their defense is the equal and opposite reaction to their offense, giving up an almost incomprehensible 507.7 yards per game. In fairness, that number isn’t entirely the defense’s fault; when your offense plays at a fast pace, your defense is going to be on the field a lot. Still, this isn’t the same unit that featured luminaries like Andrew Jackson, Xavius Boyd, and Jonathan Dowling last year. WKU returns just 38.2% of their total tackles from last year, which is the third-fewest in the country. It has shown on the field. The Hilltoppers have given up 41 points per game, are 104th in 3rd down defense, and 114th in passing efficiency defense. They’re a surprisingly good 31st in the country in red zone defense, but they give up so many big plays that the red zone isn’t even a factor on a lot of drives. It was something that the Mids had seen before, then, but against WKU they just didn’t handle it well at all. WKU’s talent probably had something to do with that. The question in this year’s game is whether a less experienced Hilltopper defense will be able to pull of the same scheme. None of the other Navy opponents that tried it (Hawaii, South Alabama, Texas State, Temple) have been able to. Then again, the 2-4-5 look is only one element of what WKU did. If you look at those pictures, you might also notice how close to the line of scrimmage their safeties were lined up. Western Kentucky was extremely aggressive with their secondary, something that none of the copycats (other than maybe Hawaii) really tried. Navy had plenty of opportunities in the passing game– they threw it 17 times– but couldn’t hit the broad side of a barn when they dropped back to throw. Fortunately for Navy, they’re just coming off of a game where they were able to hit a lot of barns. Rutgers might not have lined up the same way as WKU, but they were also very aggressive in using their secondary in run support. 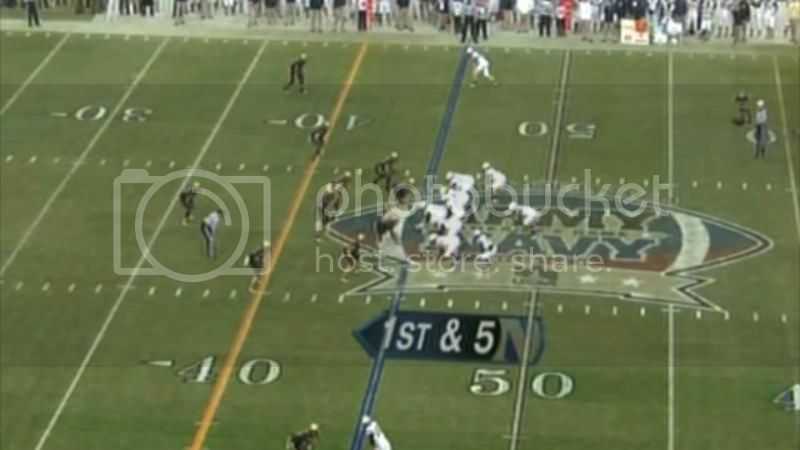 Navy managed to roll up 400 yards of offense against a talented defense that sold out to stop the option. 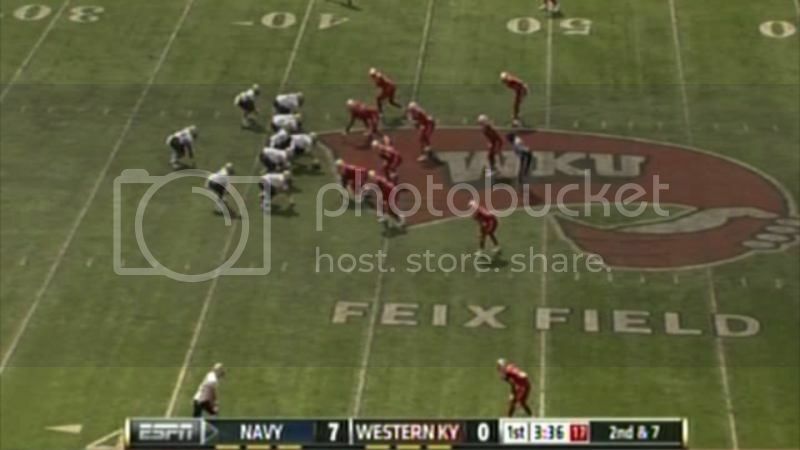 If Navy was that successful against WKU last year, they probably would have won that game. That would appear to have things trending in the right direction for Navy; WKU probably doesn’t have the talent to pull off the scheme they used last year, and the Mids have already demonstrated this year that they’re more capable of doing what it takes to make an aggressive secondary pay. It would appear then that this game has all the ingredients necessary for a shootout. That makes it a mental test as much as anything else. Western Kentucky is going to score points. That’s not a knock on the defense; they just score on everybody. Points mean pressure. The Navy offense can’t let the pressure to keep pace turn into mental errors, especially turnovers. On the other side of the ball, the defense can’t allow themselves to get frustrated. They can’t be so desperate to make a play that they don’t trust their teammates to do their jobs. That’s what leads to overrunning plays, missed tackles, and being out of position. Against a catch-and-run team like Western Kentucky, that spells disaster. WKU isn’t immune to mistakes; they might not turn the ball over much, but they do average 7 penalties a game. There will be opportunities for the defense to get off the field. The Mids just can’t allow themselves to get sloppy if WKU is able to score early. Hopefully, with a little mental discipline, the Mids will be able to get back to their winning ways. Mike, thanks for another great analysis. Thanks, Mike. Now I am as prepared as can be to watch the game.